It was an honor to be part of an unusual Good Friday event at St. Paul’s Baptist Church in Philadelphia last week. My Penn colleague Dr. Guthrie Ramsey and the St. Paul’s pastor Dr. Leslie Callahan devised a series of reflections on the Seven Last Words that drew on the gifts of various spoken word artists and singers, the church’s own liturgical dancers and choir, and, binding it all together, the musical gifts of Dr. Guy’s Musiqology, featuring Guy at the piano. It was called Rhythms of the Cross: Seven Good Friday Movements. We heard the voices of Tulani Kinard (of Sweet Honey in the Rock), Clarence E. Wright, Valerie Bridgeman, Greg Corbin, Tyler Brown, and Charisse R. Tucker. At Guy’s invitation, mezzo Teresa Washam and I performed my version of the plainchant melody “Christus Factus Est”, from my Three Sacred Songs. When Bridget Ramsey (Guy’s daughter) opened her solo performance with a wordless vocalise over blues changes, I sensed a musical connection with the long melismas of my plainchant-based piece: two musics separated by a thousand years, but bound together in the grace-filled gift we call melody. I was also privileged to perform with the band on one number – thanks for the invitation to sit in, Guy! And here I am with a few of the other artists – that’s Guy, second from the right. There has been a lack of posting here due to a deadline for my Philadelphia Chamber Music Society commission. But this week I sent the last movement of my new violin and piano to my brilliant editor/computer notation wizard, and I am now catching up on various neglected tasks. I’ll write about the PCMS piece in another post, for now I’ll just say it is called Five Poems – it was originally going to be a Violin Sonata, but the movements feel more like character pieces than something “symphonic” in conception. The soprano soloist for the New Juilliard Ensemble performance of my From a Book of Hours has been named: Alexandra Razskazoff. There is a brief bio of her here (scroll down) from a press release on a Juilliard performance of Le nozze di Figaro this past spring. And if you are in New York City this weekend, Mimi Stillman and Bart Feller will be doing my Badinerie Squared at a New York Flute Club program this coming Sunday. Music is undervalued in more ways than just through insufficient royalty payments for streaming audio – read this essay by Craig Havighurst. 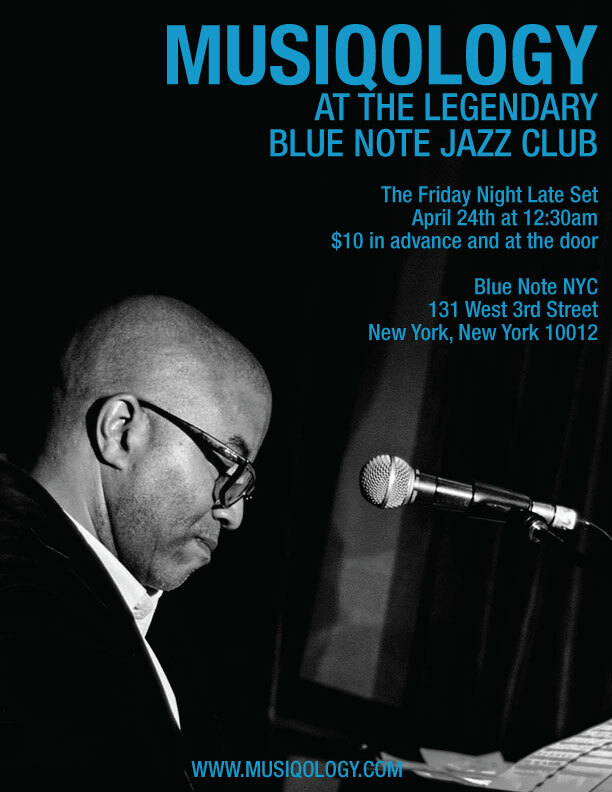 – my Penn colleague Guthrie Ramsey plays at the Blue Note this Friday, April 24 (see poster below). Check out Dr. Guy’s blog, Musiqology. – The New York Virtuoso Singers offer a program with works by Luigi Dallapiccola, Elliott Carter, Thea Musgrave, George Perle, George Tsontakis, Hugo Weisgall, Karol Rathaus, Joel Mandelbaum, Leo Kraft, Allen Brings, Edward Smaldone, Bruce Saylor and David Schober at Merkin Hall in NYC on Saturday, April 25, 8:30 pm. – Bowerbird presents Either/OR playing For Philip Guston by Morton Feldman in a free concert at The Rotunda in Philadelphia this coming Sunday, April 26. The performance begins at 3 pm. Scored for piano/celesta, flute, and percussion, this is a work in Feldman’s late super-long style; the piece will last about 4 and a half hours. Check out a video hangout with an all-star group of commentators, including my Penn colleague Guthrie Ramsey, as they discuss Coltrane’s A Love Supreme on its 50th anniversary. The Amazing Bud Powell: Black Genius, Jazz History, and the Challenge of Bebop – Guthrie P. Ramsey, Jr.
That last item is by one of my colleagues at the day job – check out his blog here. – John Amis on two new Britten biographies. There are some choice anecdotes in the post; for example, Amis describes sitting with Erwin Stein at the premiere of Peter Grimes in 1945, an amazing thought. – as an appendix to my Denk/Ligeti post, here is Denk coaching Dvorak for the Chamber Music Society of Lincoln Center. – Guthrie Ramsey, my colleague at my day job, has a revamped website. Check out the substantial series of posts he did relating to his course on African American music – here‘s the first one. His new book on Bud Powell has just come out. Not much posting happening lately as I am pushing to finish up the piano consortium commission. Three movements are complete; two remain – the first and last in the set. The opening movement is nearly done: a harsh, dark chorale, dark in register, bitter in affect, with ornaments that mutter or sweep upward. There will be fanfares and a toccata for the finale. – Kile Smith posts more eloquently than I – and more comprehensively – about last week’s Lyric Fest program. – my colleague Guthrie Ramsey has been writing a series of very substantial posts springing from his course on African-American music – the first one is here. He also has a guest post by Penn grad composer Erica Ball, writing about a recent visit to Penn by Brett Sroka and his group Ergo. – Minnesota Public Radio offers a conversation with Maria Schneider here. -the fine composer Hayes Biggs (a friend of mine from Columbia U days) has redone his website – there’s audio and more to explore. Dr. Guthrie P. Ramsey, Jr. performs “Nobody’s Fault but Mine” from Penn Arts & Sciences on Vimeo. Joo Won Park: TOCCATA for contact microphone, found objects and computer. Penn colleague Guthrie Ramsey on Whitney Houston here. Nice to see somebody focusing on the music-making, instead of the persona, personal life, number of records sold, etc. Mark Adamo, Bruce Adolphe, William Bolcom, John Corigliano, Richard Danielpour, Roger Davidson, David Del Tredici, David Felder, John Harbison, Stephen Hartke, Jennifer Higdon, Aaron Jay Kernis, David Lang, Fred Lerdahl, Thea Musgrave, Shulamit Ran, Joseph Schwantner, Steven Stucky, Augusta Read Thomas, Joan Tower, George Tsontakis, Richard Wernick, Chen Yi, Yehudi Wyner, Ellen Taaffe Zwilich. NYVS is focusing on women composers this season, with concerts on March 25 and May 13, including music by Penn colleague Anna Weesner on the latter date. Guthrie Ramsey, my colleague at the day job, is coming out with a new CD soon, and has made a video about the disc. The project pulls together a wide variety of musical genres, personnel, recording venues – Guy is more interested in inclusivity than in maintaining boundaries. Hence the irony of the disc’s title: there’s a whole lot of folks in this waiting room, and we are all invited in.